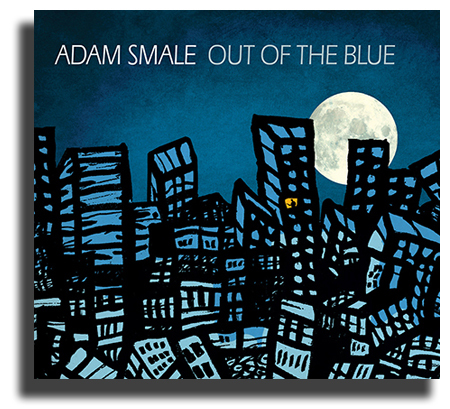 Get Your Copy of Adam Smale’s Latest Album, OUT OF THE BLUE for Just $9.99! Click Here to get OUT OF THE BLUE Now! You won’t hear any squawks, blurps, bleeps, and noises that hardly resemble music like what some consider Jazz nowadays. But you will hear music with a beat and something you can dig! The ability of the artist to tell stories through instrumental music is an art that many feel has been lost. With his personally designed 7-string guitars, and a mastery honed by many years of performing, the influence of a diverse array of brilliant guitarists and musicians from different styles, Adam has stories to tell you if you listen. Influences include Bluegrass legends Flatt & Scruggs, guitar phenom Lenny Breau, Mr. Guitar Chet Atkins, Country picker Albert Lee, and rocker Eddie Van Halen. He later discovered a goldmine of jazz guitar masters, including Pat Martino, John Scofield, Pat Metheny, Tal Farlow, Jim Hall, and Kurt Rosenwinkel, along with Charlie Parker and Bill Evans. It is his “down home” beginnings is what make Adam’s music so appealing to a wide range of audiences. So click the order button below and get instant access to Adam Smale’s latest album, OUT OF THE BLUE, and discover why critics and fans alike are raving about this fantastic guitarist. You will receive your digital download of Out of the Blue immediately after placing your order.